Larimar is a soft sky-blue crystal that embodies the tranquil sea and sky energies. With its streaked white patterns invokes the soothing colors of the Caribbean waters that surround the island where it is found. Larimar, this rare type of pectolite, is found only in the Dominican Republic being formed in cavities within basaltic lava. It ranges in color from green through greenish blue to blue. Although pectolite is found in many locations, none have this unique volcanic blue coloration. This amazingly beautiful stone originally has been discovered in 1916. It was named by the person who rediscovered it by combining his daughter’s name, Larissa, with the Spanish word for sea “mar”. 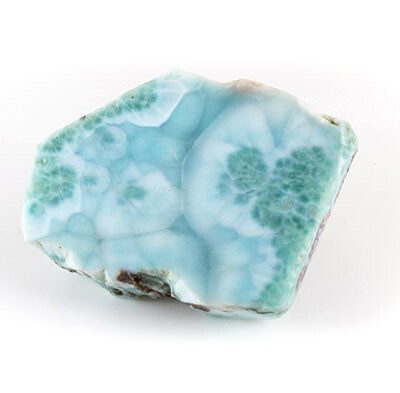 Larimar is known to be particularly helpful for cartilage and throat conditions. It might dissolve blockages of the head, neck and chest. It relieves high blood pressure and stress related illnesses. Crystal of the Throat Chakra, it helps communicating emotions. It is a powerful emotional cleanser and healer. Good for stress related imbalances and excessive fear and anger. Not a traditional birthstone.